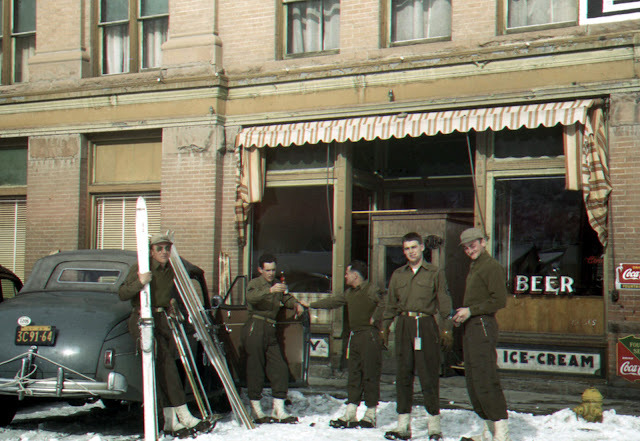 Five 10th Mountain Division Skitroopers in uniform stand outside a small store at the Jerome Hotel in Aspen, Colorado (1943 or 1944). Anthony Dillon, far left, holds skis. Man on far right is identified as photographer Bill Southworth. At the Jerome Hotel in Aspen, Colorado, the men unwind after a day of skiing. Even though the troops skied during training and camped in the cold and snow, when they had leave for the weekend, many of the soldiers could be found at nearby ski areas. After the war, several men of the 10th were instrumental in building the recreational ski industry that known today.